As Halloween approaches and our thoughts turn to the weird and witchy, we wanted to highlight an early-nineteenth-century firefighter’s coat, called hikeshibanten, since it features a spooky spider. Made in the Edo period in Japan, these firefighter’s coats were reversible, and this design is actually on the interior of the jacket, only visible when the jacket has been turned inside out. A large spider—with an endearing face—looms over the shoulder of the jacket, where it hovers menacingly over an abandoned go board (Pacific Northwesterners may have unnerving flashbacks to the giant house spiders that descend on Seattle in the autumn). The range of tonalities centers on indigo, white, black, and greyish-brown, with red accents on the fan; this color palette visually unites the work, creating parallels between the spider’s eyes and the go pieces. The method of dyeing used, tsutsugaki, is a type of resist dyeing. The design was drawn on the cotton using rice paste, and these initial lines are visible now as the lightest areas of the design. The spider and the go board were dyed their respective colors, and covered with more rice paste to block any other dye from entering the area. Then the fabric was dipped into indigo multiple times, dried, soaked in hot water again, and the rice paste was scraped off to reveal the layering of colors; this whole process could take 20 days. But why is this spider on a firefighting jacket at all? The jacket tells a story from the life of Minamoto no Yorimitsu (948–1021), a warrior-hero. The story is as follows: Yorimitsu was sick, and was resting in bed. He was visited by a priest—but the priest was actually a giant spider (tsuchigumo) in disguise! Yorimitsu, being very clever, sees through the disguise, and attacks the spider with his sword, wounding him. Yorimitsu’s four attendants, called the Four Heavenly Kings, were playing a game of go while guarding him, and leapt up to track the spider back to his den. This narrative was popular in theatrical productions, and there was a song in Noh theatre specifically about tsuchigumo, the intimidating earth spider. 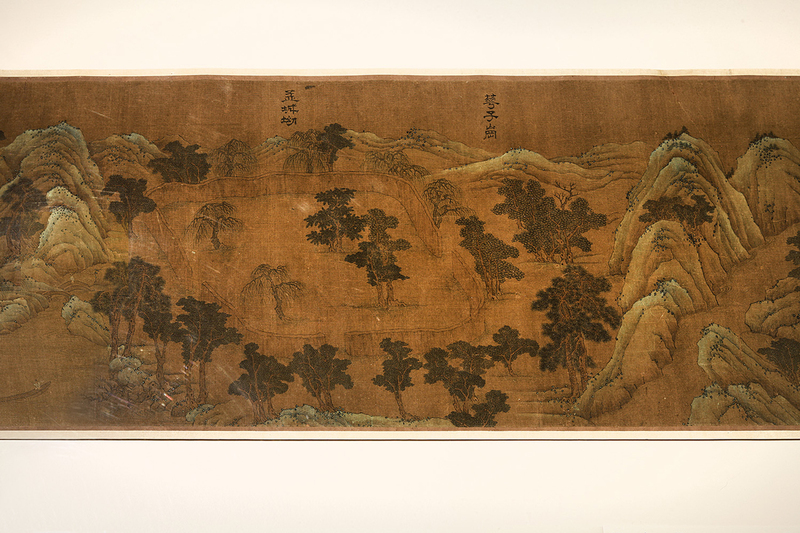 The story appears frequently in woodblock prints in the nineteenth century as well. 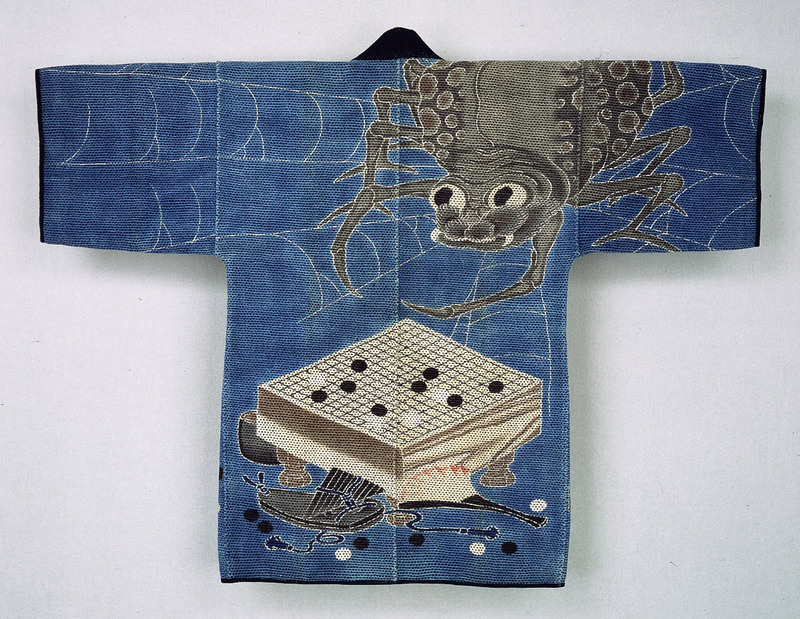 The jacket shows the moment when the go game was abandoned, with tsuchigumo retreating back to his web. So great was the hurried effort to find the spider that the attendants left behind their personal effects, scattering go pieces in their haste. The human figures in this story are removed from the jacket’s design and the firefighter symbolically takes their place. The firefighter becomes imbued with Minamoto no Yorimitsu’s special powers as a warrior-hero, and the design works as a talisman to protect the firefighter from harm. Firefighting was an especially important occupation in Edo, where most of the buildings were made of wood. The job was both dangerous and glamorous, valorized as a crucial masculine exemplar in Edo. So while these jackets were for a real, practical, dangerous job, they are also imbued with a sort of glamour, which helps explain why such an effort was taken to dye the jackets with symbolic designs. After battling a fire, the coats would be worn reversed to make the designs visible, a stunning effect that visually linked the clothing to success and survival. Listed in our records as a “commoner’s firefighting jacket,” the ordinariness of the hikeshibanten is one of the things I find so compelling about it. These jackets were objects of both use and beauty, and of hidden, personal importance to the wearer. There are several Edo firefighter’s coats in SAM’s collection, and this one is my favorite. Textiles often have an intimate history with their owners, and this firefighter’s coat makes me think about the capacity for cloth to protect us, define us, and celebrate us. This firefighter, whose name is now lost to time, found solace in Yorimoto’s defeat of tsuchigumo, literally clothing himself in a hero narrative. Richard Mellott, “Katazome, Tsutsugaki, and Yuzenzome,” in Beyond the Tanabata Bridge: Traditional Japanese Textiles, Seattle: Thames and Hudson and the Seattle Art Museum, 1993, 51-57, 55. For more on this narrative and related woodblock prints, see Kuniyoshi: From the Arthur R. Miller Collection, edited by Timothy Clark, London: Royal Academy of Arts, 2009, 268. Michiyo Morioka, “Sashiko, Kogin, and Hishizashi,” in Beyond the Tanabata Bridge: Traditional Japanese Textiles, Seattle: Thames and Hudson and the Seattle Art Museum, 1993, 107-129, 121. Adding a piece to a museum collection is an involved process. 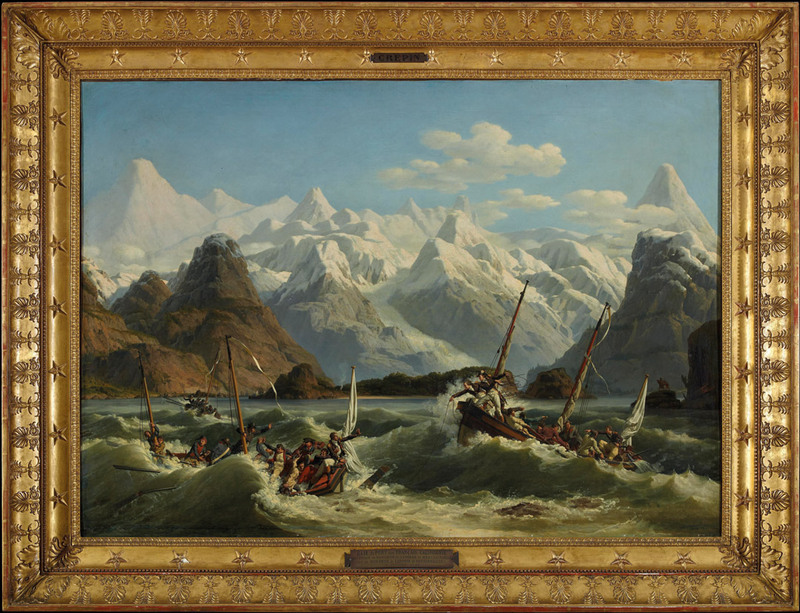 In the case of Shipwreck Off the Coast of Alaska, a painting by Louis-Philippe Crépin, the first interaction was on a trip to London when Chiyo Ishikawa, SAM’s Susan Brotman Deputy Director for Art and Curator of European and Sculpture got an email from Christie’s auction house in London about a private sale of a uniquely important painting. Museum curators continually consider art for the museum’s collection. They assess intellectual and historical importance of artworks, ownership, relevance to the larger collection, as well as condition, potential costs for conservation, framing, display, and storage. SAM’s collection includes approximately 25,000 objects, with 36 new artworks acquired so far in 2017. To acquire a work of art, the curator has to first convince the director and then the Committee on Collections (COC), an advisory group of board members and community arts leaders, who, in turn, make recommendations to the Executive Committee of the Board, which has the final vote. To give you a peek into the acquisition process, below is the curatorial argument for this newly acquired painting by Louis-Philippe Crépin. This painting represents a shipwreck of two launches from the famous French Enlightenment-era expedition led by Count Jean-François de La Pérouse, which reached Alaska in July 1786. The ships were getting ready to leave Lituya Bay when two boats were caught up in violent tidal currents and one boat capsized. The second vessel may have tried to rescue the sailors but itself went under. This painting was commissioned by the family of two brother officers who were killed in this event, and it was enthusiastically reviewed when it was displayed at the 1806 Salon. It has been in the family since that time. La Pérouse’s expedition into the Pacific Northwest followed celebrated efforts by Spanish and British explorers in the previous decade. Scientific inquiry was a primary motivation, but the explorers were also seeking political advantage for their governments. On July 2, 1786 the expedition arrived at a previously uncharted bay on the Alaskan coast. La Pérouse named it Port des Français, but we know it today as Lituya Bay. After successfully navigating the rocky entrance to the bay, the crews set up camp, planning to stay for a month to explore the bay and glaciers on the mainland at the northeast end of the bay. They concluded their investigations sooner than planned and made ready to leave on July 13. Two boats were sent ahead to sound the channel near the perilous entrance to the bay so that they could chart the depth; one officer miscalculated the distance from the rocks and found his boat engulfed by a sudden high tide. Both boats capsized, and twenty-one men were lost in ten minutes. The painting closely follows La Pérouse’s own narrative of the disaster and draws on images by the professional artists who illustrated the Atlas du voyage de La Pérouse. The two endangered boats teeter in the foreground amid boulders and high waves as a third tries vainly to reach them. The two mother ships emerge from behind Observatory Island (after the tragedy, La Pérouse redubbed this Cenotaph Island). The urgent efforts of the sailors caught up in the roiling waves are set against the majestic backdrop of the Fairweather mountain range. At the right, gesturing from a rock, are two members of the Tlingit tribe, witnesses to the event, who searched in vain for survivors, according to La Pérouse. The interaction with the French and the story of the shipwreck would remain part of the Tlingit oral tradition. Crépin captures the men’s desperate actions as conditions suddenly changed. The two La Borde brothers, in the boat at right, offer a line to their doomed comrades just before they too are swept under. The terrible drama is all in the foreground, at eye level. Beyond the turbulent waves in the pass the bay is calm, the mountains of the Fairweather range are impassively still, and the sky is clear and blue. Born in Paris, Louis-Philippe Crépin was a specialist in marine painting who had trained under celebrated artists Claude-Joseph Vernet and Hubert Robert. His interest in marine subjects kindled by Vernet, Crépin made his debut at the Salon of 1796 with a painting of the port of Brest. His primary patron throughout his long career would be the Naval Ministry of the government. Many of his works are in the National Maritime Museum in Paris, while others are in provincial museums throughout France. This work would likely be the first painting by Crépin in an American museum. In addition to the painting’s superb quality, it has never been on the market, remaining in the family that commissioned it for over 200 years. This undoubtedly has contributed to its excellent state of preservation. The Empire frame, an impressive part of its visual impact, is from the same period as the painting. 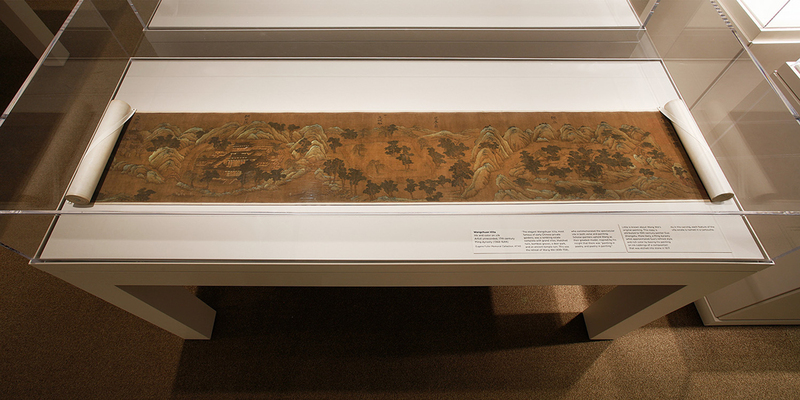 Like the curators of the Salon, Ishikawa saw something exceptional in this work that lent itself to SAM’s focus. “It offers an insight into the European perspective of the Northwest as an uncharted area that hadn’t been recorded—the wonder and exoticism. Count Jean-François de La Pérouse who led the expedition to Lituya Bay, which at the time he named the Bay of the French, though it was clear by the trading skills of the Tlingit that this expedition was not the first to find this bay.” Ishikawa continues to point out that, “Crépin is not a famous artist but this is a painting that transcends its genre. It’s an impressive and successful example of human drama.” See this painting installed in Extreme Nature: Two Landscape Paintings from the Age of Enlightenment, opening December 23. Accompanied by the return of Volaire’s much admired Eruption of Mount Vesuvius with Ponte della Maddalena in the Distance, painted around the same time as the Crépin and last seen hanging at SAM this spring in Seeing Nature: Landscape Masterworks from the Paul G. Allen Family Collection, this installation will instill a very human awe and fear in the face of nature’s power. Image: Shipwreck Off the Coast of Alaska, 1806, Louis-Philippe Crepin, French, 1772-1851, oil on canvas, 40 15/16 × 58 11/16 in., Seattle Art Museum, European Art Acquisition Fund; Bill and Melinda Gates Foundation Art Acquisition Fund; by exchange Gift of Mrs. Lew V. Day in memory of her husband; Gift of Arthur F. Ederer; H. Neil Meitzler, Issaquah, Washington; Col. Philip L. Thurber Memorial; Gift of Mrs. Donald E. Frederick; The late Mr. Arrigo M. Young and Mrs. Young in memory of their son, Lieut. (j.g.) Lawrence H. Young; Phillips Morrison Memorial; Gift of Mrs. Oswald Brown, in memory of her parents Simeon and Fannie B. Leland; Gift of Miss Grace G. Denny in memory of her sister Miss Coral M. Denny; Gift of friends in memory of Frank Molitor; Purchased from funds contributed in memory of Henry H. Judson; Purchased from the bequest of Charles M. Clark; Gift of Mrs. John C. Atwood, Jr.; Norman and Amelia Davis Collection; Norman Davis Collection; Mrs. Cebert Baillargeon, in memory of her husband, 2017.15. Stroll through the Olympic Sculpture Park on a summer day, and you’ll find yourself immersed in an overload of the senses. The Puget Sound scents the air around Alexander Calder’s towering sculpture, The Eagle, with a salty freshness, while the waves below lap in the wind. Uninterrupted sunlight warms the curving, concrete benches of Roy McMakin’s Love & Loss to the touch. Bike commuters coast along the Elliott Bay Trail, an urban artery connecting bustling downtown Seattle and the neighborhoods to the north. But while visitors enjoy the natural and manmade beauty of the park, the outdoor sculptures on view are constantly under attack by the very elements that makes the park so special. Coating the surface of Love & Loss is one part of its conservation treatment. When the conservators found that the original acrylic-polyurethane coating wasn’t performing well within the interactive environment of the installation, Brown worked with artist McMakin to replace it with a water-borne acrylic paint designed for pools, which she reapplies every year in order to preserve the aesthetic he originally envisioned for the piece. 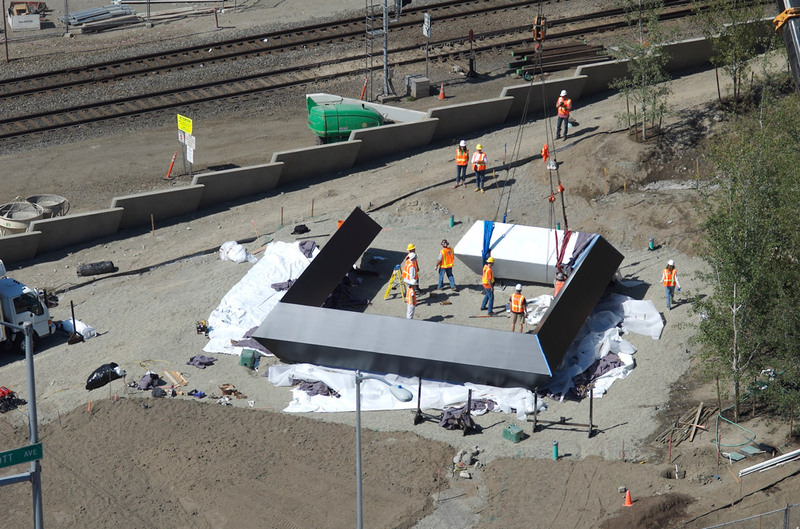 By comparison, sculptures painted with matte, highly pigmented paints, such as The Eagle and Tony Smith’s Stinger, are susceptible to damage by human touch because oils and contact more easily mar and break down the underbound coatings. 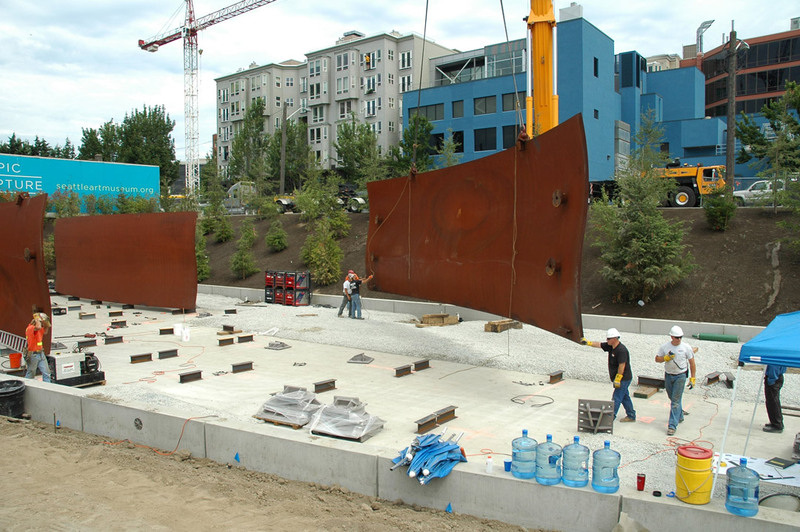 The park’s proximity to the Puget Sound also brings the problem of chloride corrosion, making the coatings’ maintenance essential to the preservation of the metal sculptures. As summer approaches, much of the conservation work at the park moves from behind-the-scenes to more publicly visible processes. Brown will soon begin cleaning all of the art and treating areas where corrosion has appeared. Several larger projects will also take place. This year, she hopes to manage refabrication of the Love & Loss ampersand and to determine a painted surface that will work for that portion of the sculpture in the long term. The next time you’re at the park, sitting on Love & Loss may feel a bit different, knowing more about the care that lives both within and beneath its surface. 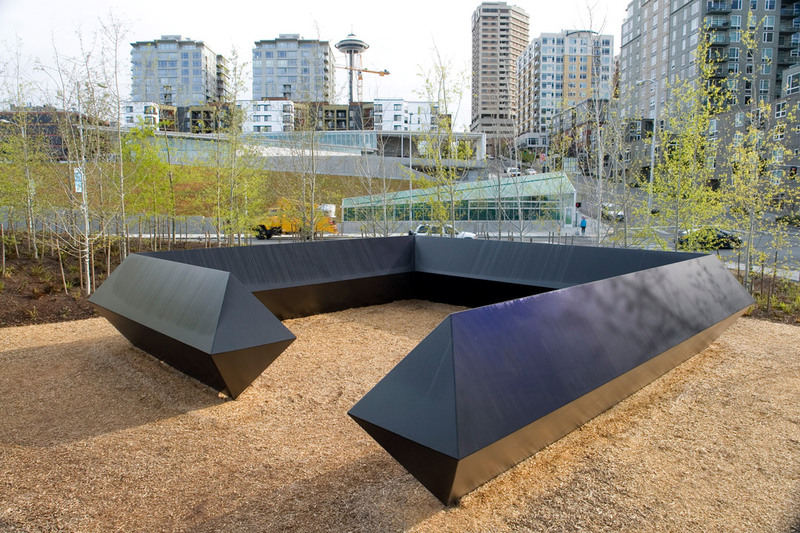 This post is the fourth installment in a series of stories exploring the history of the Olympic Sculpture Park in celebration of its 10th anniversary. Over the course of this year, we will continue reflecting on the Park’s evolution over the past decade. Images: Photo: Benjamin Benschneider. Love & Loss, 2005-2006, Roy McMakin, American, b. 1956, mixed media installation with benches, tables, live tree, pathways and illuminated rotating element, Overall: 288 × 480 in., Olympic Sculpture Park Art Acquisition Fund and gift of Paul G. Allen Family Foundation, in honor of the 75th Anniversary of the Seattle Art Museum, 2007.2, photo: Benjamin Benschneider, © Roy McMakin. Stinger, 1967-68 / 1999, Tony Smith, American, 1912-1980, steel, painted black, 6 ft. 6 in. x 33 ft. 4 1/4 in. x 33 ft. 4 1/4 in., Gift of Jane Smith, 2004.117, photo: Paul Macapia © 2006 Estate of Tony Smith. The word “rummage” has satisfying and nostalgic connotations for me. Hearing it triggers memories of summertime outings to what my grandma called rummage sales, where I’d pore over knick-knacks and tchotchkes in search of another person’s junk that would be my treasure. To rummage is to search with a kind of directionless mind—to not know what we’re looking for until we find it. When we rummage we’re also navigating through a mass of objects, of all varieties, without neat structure or organization. If you think about it, it’s the disorganization and diversity of these things that gives us something to do: We sort the unsorted according to our principles and desires. In the season of spring cleaning it’s much easier for me to imagine contributing to the rummage pile than doing any rummaging of my own. Still, it seems a fitting time to reflect on Mark Tobey’s important 1941 painting Rummage, celebrating the barrage of sights and sounds found at the Pike Place Market. The market became a touchstone for Tobey, and in the art of Pacific Northwest modernism, Tobey’s work pictures the market most and best. The connection he felt to the energy, the people, and the goods was quasi-spiritual. Tobey called the market “a refuge, an oasis, a most human growth, the heart and soul of Seattle.”1 His visits to the market were restorative and cathartic, and they also provided plentiful aesthetic stimulation for his work. 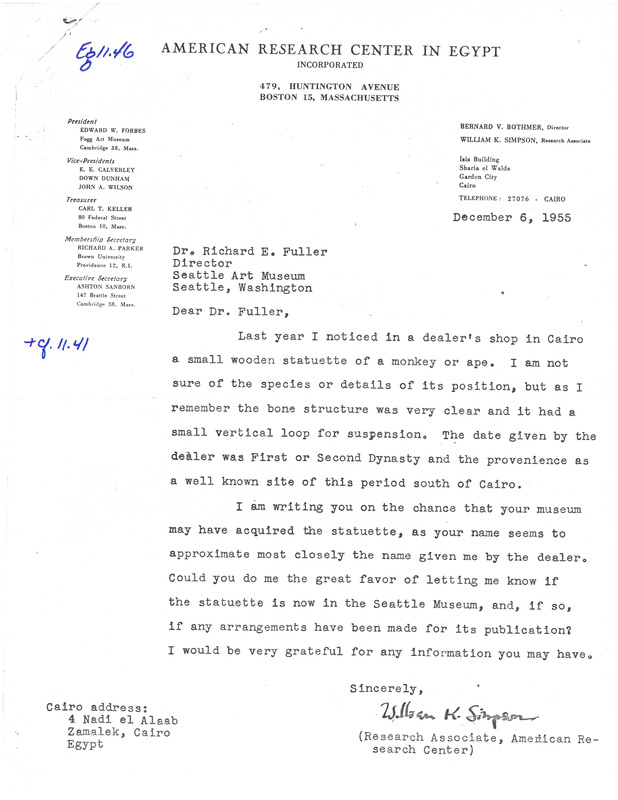 While he would return to Pike Place for subject matter at various points, the years 1940–1942 saw Tobey complete the greatest number of market studies. 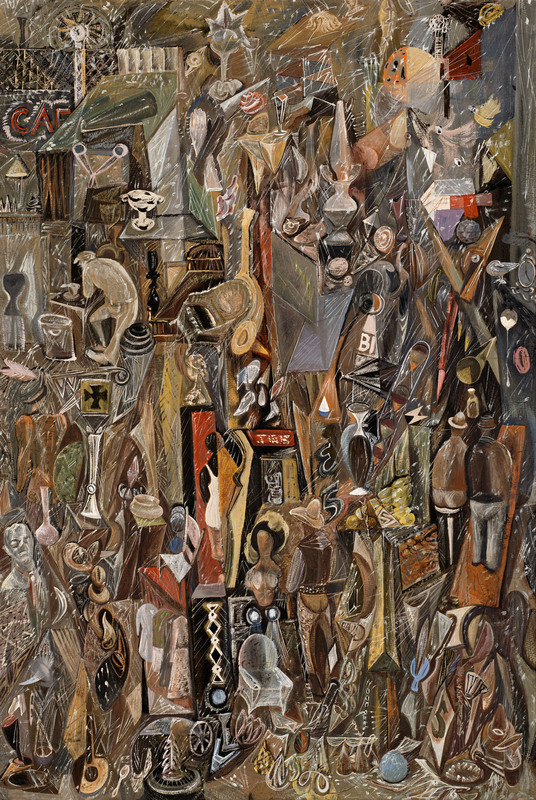 Rummage, painted in 1941, fits into this period of concentrated attention. Tobey gives us a maelstrom of ‘40s Seattle symbols: lounge chairs, mannequins, spoons, wheels, neon signs, birds, and clocks, arranged haphazardly, and pictured from different vantage points. His figures join the scene quietly and timidly, their presence overwhelmed by the visual noise around them. Looking at this painting, I picture Tobey doing his own rummaging, perusing the market’s stimuli and selecting his subjects from it. In a broader sense, he was also selecting from Western art’s tradition of forms in space, Cubism’s rethinking of those forms, and Asian art’s different emphasis on line. One of the Seattle Art Museum’s best-traveled pictures, Rummage has greeted viewers in Tacoma; Portland; San Francisco; Detroit; New York City; Poughkeepsie; Palm Beach; Cincinnati; Baton Rouge; Utica, New York; Albany; Buffalo; Baltimore; Andover; Copenhagen, Denmark; Frankfurt, Germany; Berlin; Nuremburg; Munich; Hamburg; Essen; London; Colorado Springs; Pasadena; Milwaukee; Valparaiso, Indiana; Fort Worth; Los Angeles; Oakland; Cortland, New York; East Lansing, Michigan; Columbia, Missouri; Newark, Delaware; Tucson; Aurora, New York; Macon, Georgia; Geneseo, New York; Jacksonville, Illinois; Lafayette, Indiana; Neenah, Wisconsin; Madison; Chicago; Pittsburgh; Interlochen, Michigan; Dallas; Osaka, Japan; Omaha; Miami; Des Moines, Iowa; Philadelphia; and of course, right here in Seattle. Here’s proof that rummaging—seeking and finding—translates well. 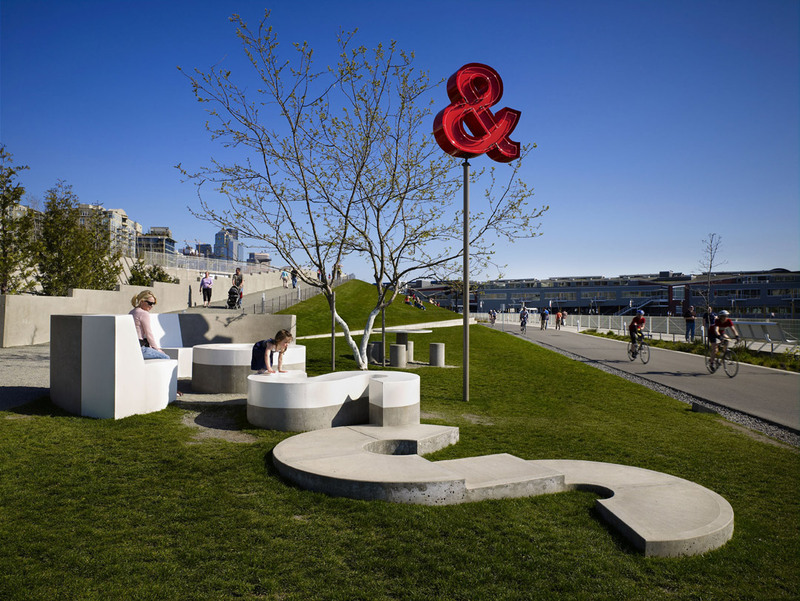 Walking through the nature and art of the Olympic Sculpture Park, from the low-lying valley around Richard Serra’s Wake to the span of open water that fills the sightlines of Jaume Plensa’s Echo, one experiences an impeccable balance of nature and whimsy. “I think the way all of the art in the park works together, in combination with the way everything is spaciously placed, is what makes the Olympic Sculpture Park truly unique. You have breathtaking views, while the art can really stand on its own and be appreciated,” said Catharina Manchanda, SAM’s Jon and Mary Shirley Curator of Modern and Contemporary Art. But, the process of achieving this effect was far from simple. 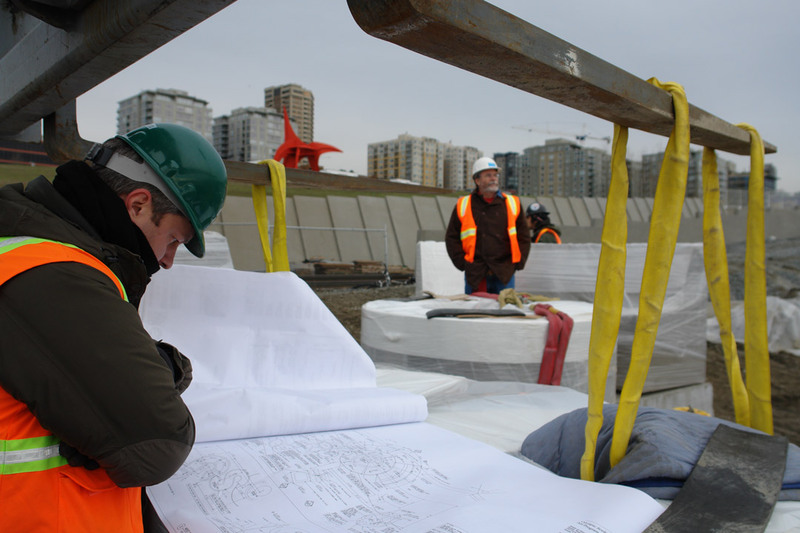 SAM’s former Director of Exhibit Design, Michael McCafferty, led the process of arranging the park’s permanent sculptures within Weiss/Manfredi’s architectural design while collaborating with artists, curators, museum staff, and other partners. McCafferty approached the placement of the art as if he were working with a “very complex gallery”—a larger, outdoor version of the exhibit spaces he designed at SAM’s downtown location and the Asian Art Museum. He worked with a to-scale model of the Park that included the varied topography of its landscape, as well as miniature, hand-painted versions of most of the 21 works that were on view when the Park opened. 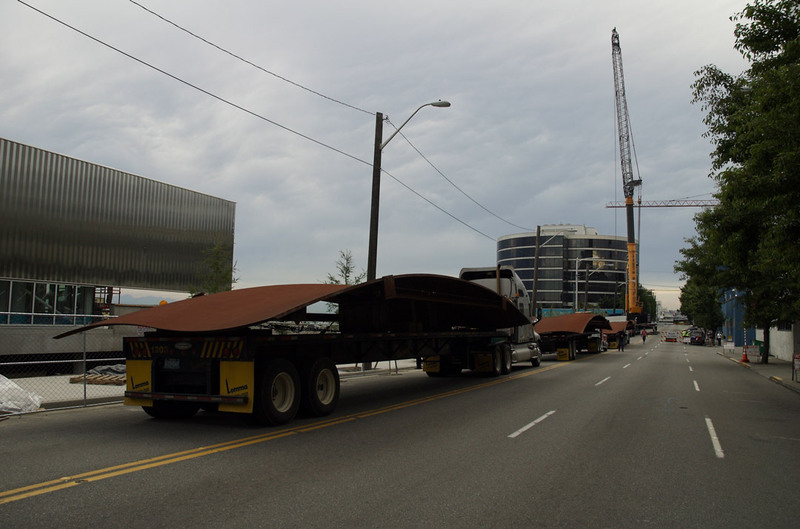 McCafferty began by placing the largest pieces that would be on view, such as The Eagle by Alexander Calder, the Sculpture Park’s founding gift from trustees Jon and Mary Shirley, as well as Stinger by Tony Smith and Typewriter Eraser, Scale X by Claes Oldenburg and Coosje van Bruggen. “I would take the various models of the sculptures and move them around and around, considering the best viewing angles for someone who will walk all the way around the piece while they’re in the park and also for someone driving along Elliott Avenue,” McCafferty said. The medium and smaller sized works were then sited, through a design that balanced their weights and masses with the larger sculptures and the landscape, in a spirit he likened to a Japanese garden. Over the past ten years, the park has grown and changed. The Aspen trees around Stinger stretch taller, the grass beneath The Eagle has thickened and new sculptures have entered the collection. One of the most recent is Jaume Plensa’s Echo, a large-scale piece depicting a tranquil visage that was donated by trustee Barney Ebsworth in 2013. Maintaining the approach established during the Park’s initial design, Echo’s placement, looking out onto the Puget Sound, was made by considering the pedestrians and cyclists who pass beneath it, as well as those who approach it from the water. The location of Echo also thrilled the artist, as Ebsworth described: “Jaume Plensa said how wonderful the placement overlooking the Olympic Mountains is because the sculpture’s subject is from Greek mythology. It’s perfect because Echo looks out towards Mount Olympus.” This siting of Echo between nature and art, between open space and calculated design, between land and sea—embodies the ethos that makes the Olympic Sculpture Park a uniquely Seattle place to experience art. 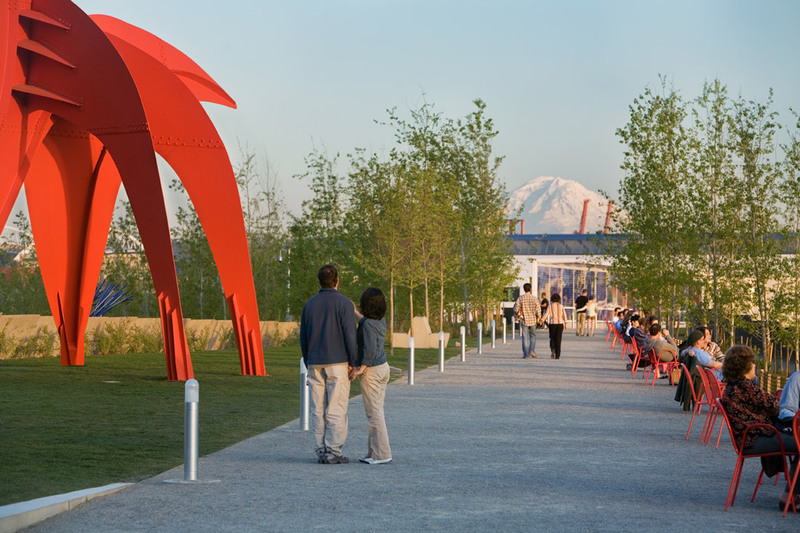 This post is the second in our series of stories exploring the history of the Olympic Sculpture Park in celebration of its 10th anniversary. Over the course of this year, we will continue reflecting on the Park’s evolution over the past decade. Each of us carries with us a lens, or lenses, through which we view the world, and that lens colors and shapes our perception of, and response to, all the sights, sounds, and smells we encounter. It’s no different when we’re viewing art. Each of us brings to the experience of viewing art our own sets of questions. Art historians produce scholarship that discusses a certain object, maker, or concept—but the questions they ask in the process reveal as much about the perspective of the scholar as they do about the object or artist under discussion. Likewise, it’s fascinating to tour through the galleries and eavesdrop on the unfiltered musings of museumgoers to the variety of art we have on display at SAM. Those comments say something about the art and the speaker. 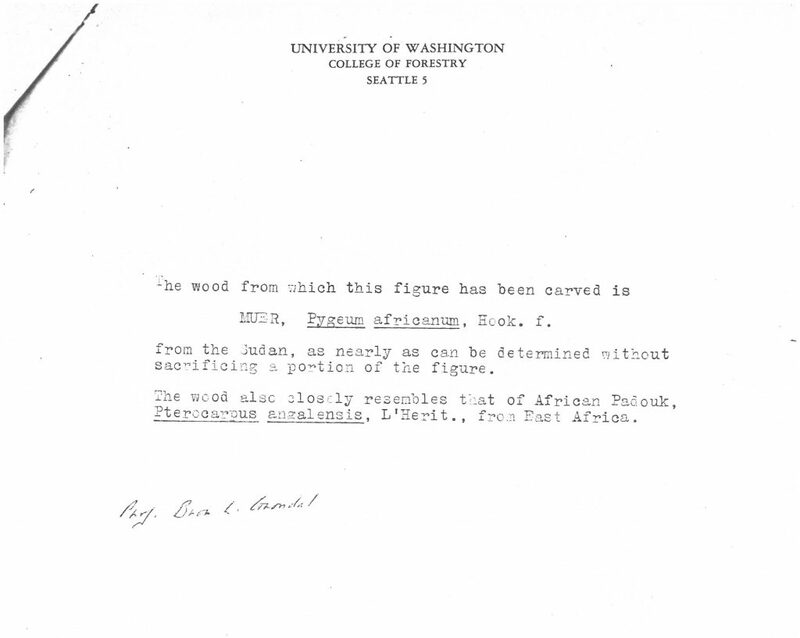 One object that’s commented on less frequently than I’d wish is this diminutive wood Amulet with mummified monkey—a piece that acts, for me, as an ever-present reminder of Dr. Fuller and his collecting principles, so neatly reflected in this ancient, tiny figurative sculpture. 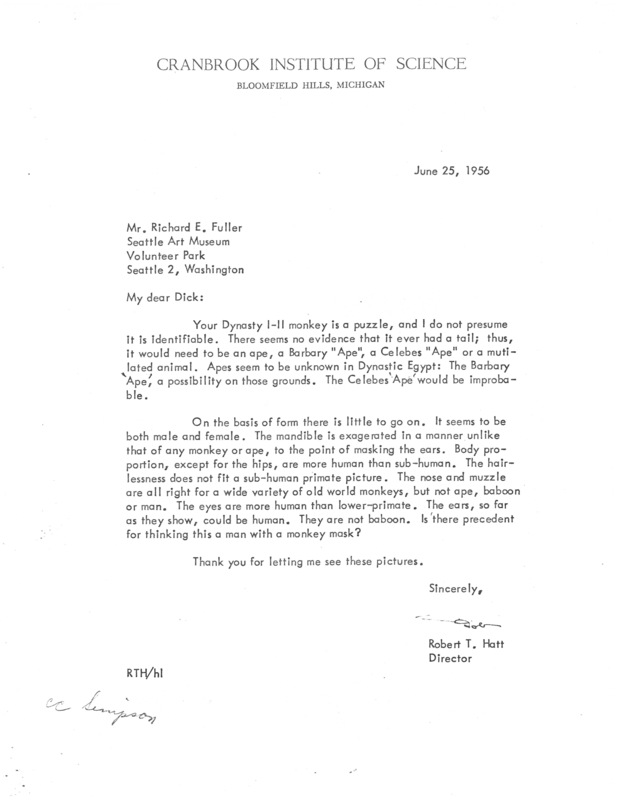 Dr. Fuller, who held a Ph.D. in geology and maintained scholarly pursuits in that field throughout his tenure leading SAM (1933–1973), collected many small, old, and odd things. Disinterested in value, he instead sought out rarity. His guiding question was: Does it have a unique character—an “essential factor”? 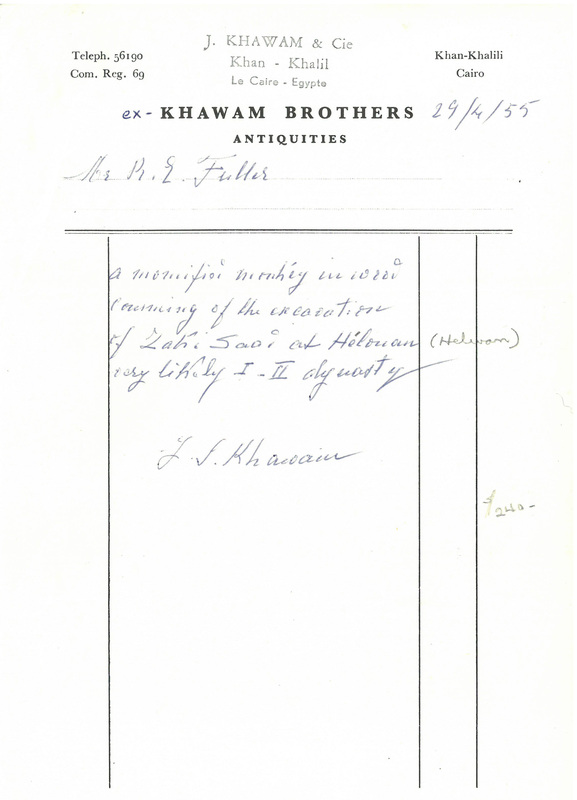 That question drove him to acquire items like this mystifying Amulet, about which little was known when Dr. Fuller purchased it from J. Khawam & Cie, Cairo, for $240 in 1955. Each of us brings to the experience of viewing art our own sets of questions—but to make our contribution, we have to actually ask them. Your curiosity could spark mine or someone else’s, and whether or not we ever arrived at fixed answers, the summation of our questions reveals infinitely more than one viewpoint ever could. 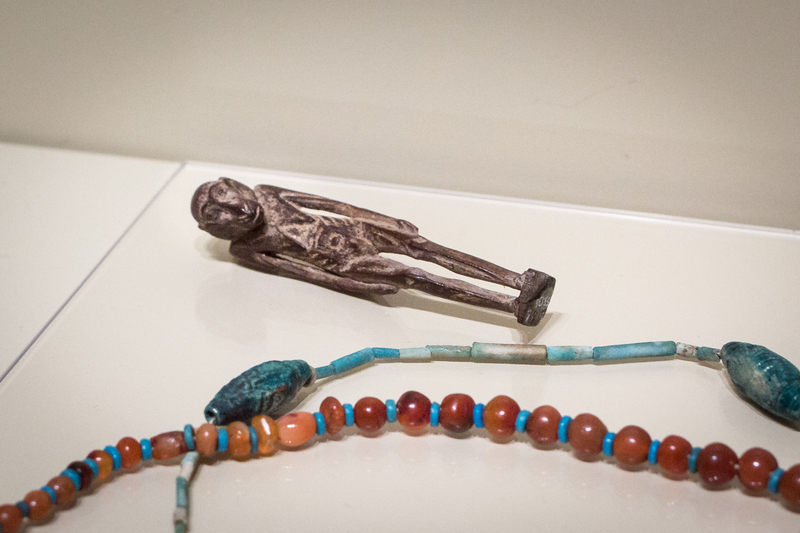 Images: Amulet with mummified monkey, ca. 2920-2649 B.C., Egyptian, Early Dynastic period, wood, 3 3/16 x 11/16 x 7/8 in. Seattle Art Museum, Eugene Fuller Memorial Collection, 55.136, Photo: Natali Wiseman. SAM’s Congolese Standing figure (Nkondi) meets and enraptures visitors in our African art galleries. Beads, feathers, and knots of string secured to the wooden figure with countless iron nails lend him a startling and uncomfortable presence. Why has he been on the receiving end of this aggressive, symbolic gesture of driving nails? 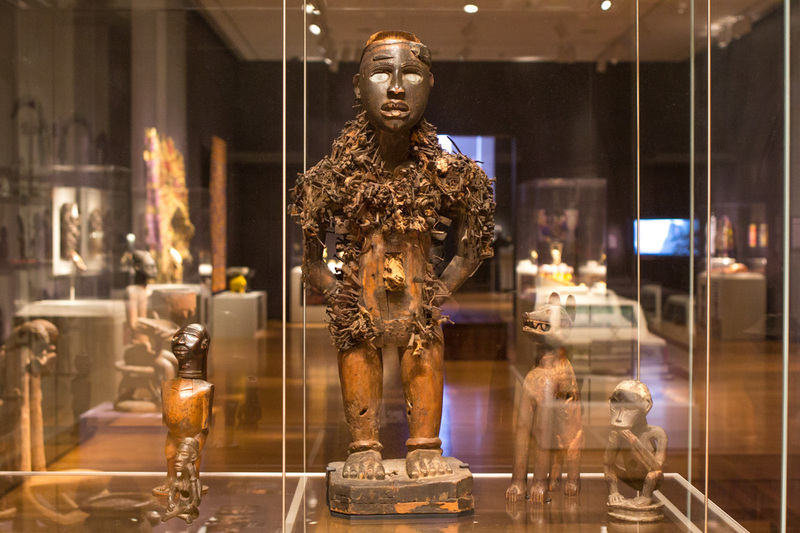 Across the country, in exhibitions at great museums like the Smithsonian Institution’s National Museum of African Art, the National Gallery of Art, the Cleveland Museum of Art, San Francisco’s de Young Museum, the Wadsworth Atheneum, and the Philadelphia Museum of Art, the Nkondi has confronted viewers with his own appearance—and with wrong assumptions about his purpose. 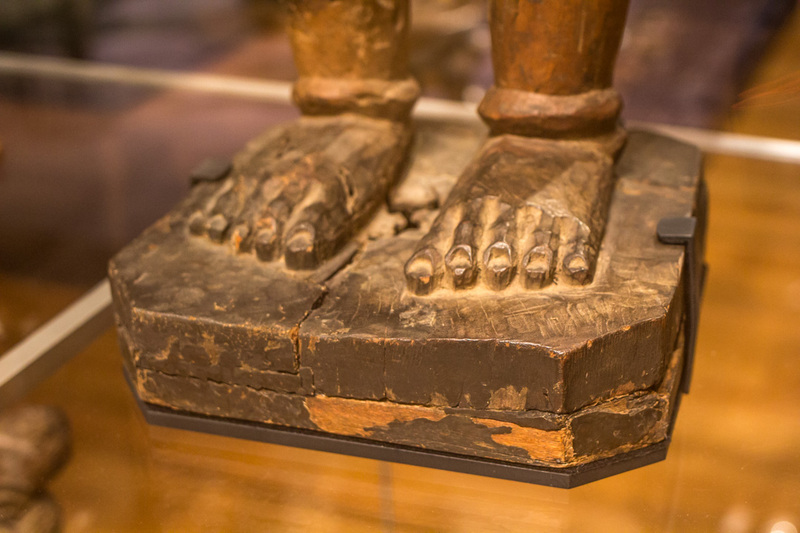 SAM’s Nkondi was purchased from Simpson in 1968 by another exceptional collector of African art, Katherine White, whose transformational 1981 gift—of which the Nkondi was part—forms the core of the museum’s African collection. 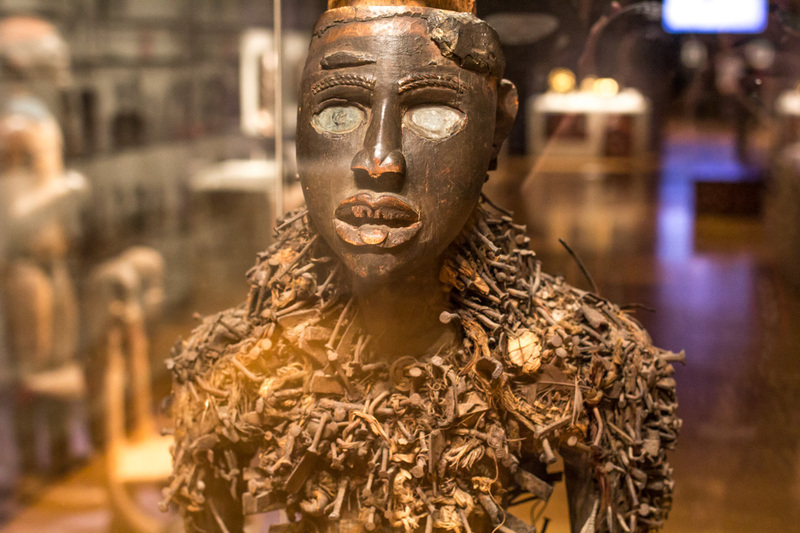 Since the Nkondi has arrived at SAM, the museum has been telling his true story and deconstructing “fetish” myths about him. Congolese advisor Fu Kiau Bunseki has offered critical insights on the Nkondi’s role as a sign of authority, and as a hearer and keeper of agreements. Check out the SAM website for rich insights on the thoughtful symbolism that informs each element of this memorable figure. Image: Standing figure (Nkondi), Congolese, wood, iron, fiber, beads, string, glass, feathers, chalk, 31 11/16 x 13 3/8 x 8 11/16 in. Seattle Art Museum, Gift of Katherine White and the Boeing Company, 81.17.836, Photos: Natali Wiseman. In the 1960s Donald E. Gordon, a scholar of the German artist Ernst Ludwig Kirchner, was producing a new catalogue raisonné on the artist, with the help and cooperation of Roman Norbert Ketterer, a collector and dealer who also served as executor of the Kirchner Estate. Gordon was a professor of art history at Dickinson College in Pennsylvania, where he served as chairman of the Department of Fine Arts. He had secured two Fulbright fellowships that took him to Germany for direct study of many Kirchner works, first at the University of Hamburg in the mid-1950s, and then at the University of Marburg in the mid-‘60s. By way of his study and connections Gordon familiarized himself with the entirety of Kirchner’s oeuvre. He successfully produced the catalogue raisonné, published by Harvard University Press in 1968, a herculean effort because of Kirchner’s productivity in painting and graphic arts. The same year marked the premiere of a retrospective exhibition on Kirchner that Gordon had organized, and for which he also authored the exhibition catalogue. The Seattle Art Museum Pavilion, this museum’s first space dedicated to the display of modern and contemporary art, was the first of three venues to host the Kirchner exhibition. Ernst Ludwig Kirchner debuted there on November 23. Amid impressive amounts of researching and writing Gordon was wheeling and dealing, too. He came upon Woman and Girl (Frau und Mädchen) in the collection of Mrs. Maria Möller-Garny, the widow of Ferdinand Möller, a Nazi-era art dealer. Woman and Girl (Frau und Mädchen) had fallen under Hitler’s ridiculous category of “degenerate art,” prompting Nazi officials to remove the painting from the Staatliche Gemäldegalerie in Dresden. Because it was taken from a state-funded museum by the government in power, it was a legal seizure at the time. Tellingly, Möller, though in the business of dealing, recognized it as a fine example of Kirchner and kept the painting in his private collection until he died. In April of 1968, seven months before the doors opened on the Kirchner retrospective in Seattle, Gordon provided the connection between Frau Möller-Garny and SAM (for a small fee, of course). 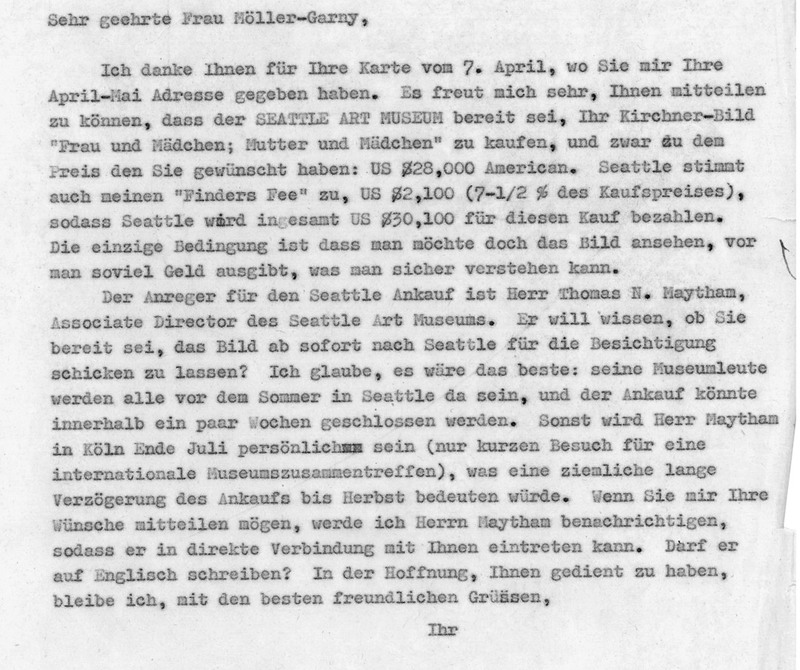 Gordon’s letter to Möller-Garny notifying her of the museum’s intention to buy, part of which we have reproduced here, is fun whether or not Sie lesen Deutsch. Both Mrs. Möller-Garny and I are pleased that you were able to secure the Seattle Art Museum’s decision so promptly, and hope that the sale may be consummated with similar dispatch. From my long knowledge of and admiration for this masterpiece, I am also personally happy at the prospect of its permanent entry into a major American museum collection. 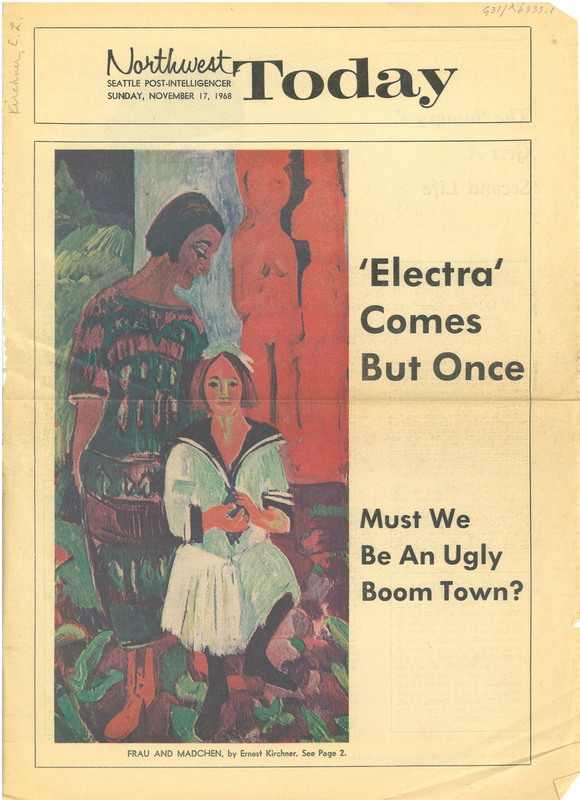 The purchase was heralded in Seattle, timely because of the Kirchner retrospective in which it featured, and high-profile because of Kirchner’s importance in the history of Modern art. On November 17, 1968, Seattle Post-Intelligencer’s Northwest Today featured a color reproduction on the front page—unfortunately adjacent to a rhetorical headline wondering about this city’s aesthetic potential. 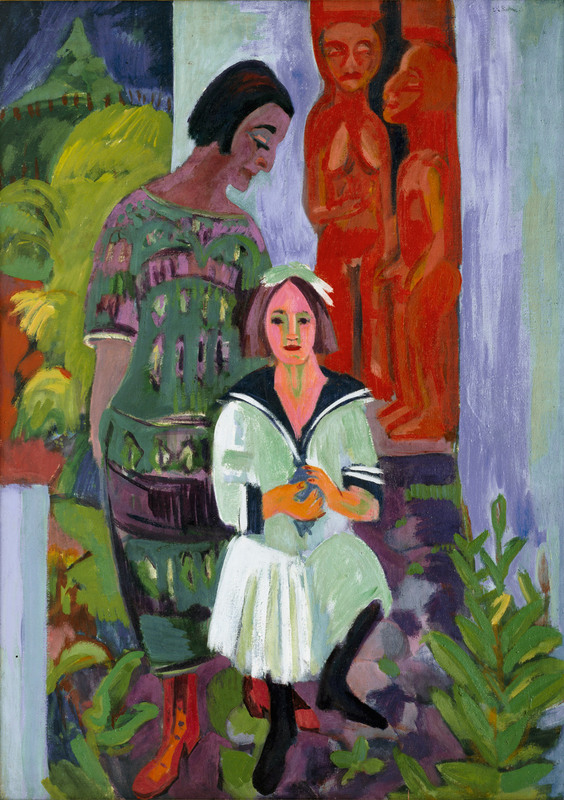 Image: Woman and Girl (Frau und Mädchen), ca. 1922-1923, Ernst Ludwig Kirchner (German, 1880-1938), oil on canvas, 66 1/8 x 46 7/8 in. Seattle Art Museum, Gift of Dr. and Mrs. Richard E. Fuller, 68.120, Photo: Paul Macapia.